After a 46-year-old man shot and killed 11 worshipers at the Tree of Life Congregation on Saturday, federal investigators turned to his posts on a social media site that is popular among white supremacists. There, they found evidence of the Robert D. Bowers’ extreme anti-Semitic and xenophobic views. To people who study extremism, it was a sign of a disturbing trend. “We are living in a moment where anti-Semitism is almost becoming normalized, and that should shock and move all of us to act,” said Jonathan Greenblatt, CEO of the Anti-Defamation League, which has been tracking incidents targeting the Jewish community for decades. In its annual report, the Anti-Defamation League documented a 57 percent rise in anti-Semitic incidents in the United States in 2017. The group says this represented the largest increase — 1,986 incidents — in a single year since it began collecting data in 1979. The only other year on record that compares was 1994, when the ADL documented a record 2,066 anti-Semitic incidents of harassment, vandalism and assault. Anti-semitism has “moved from the margins into the mainstream,” Greenblatt told Meet the Press. The shooting also comes amid a growing worry over far-right extremism. A 2017 report from the Government Accountability Office found that since the 9/11 attacks, far-right extremists were responsible for three times as many attacks as Islamic extremists, 62 incidents compared with 23. Islamic extremist attacks have killed more people — 119, compared with the 106 tied to far-right extremists. 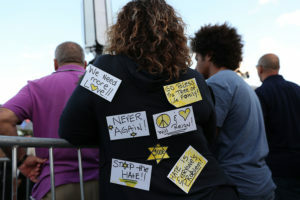 Here’s a look at how anti-Semitism and other hateful rhetoric can translate to the violence seen the past week and what can be done to stop it. The role social media has played in spreading racist, anti-Semitic conspiratorial content has “exploded” in recent years, said Keegan Hankes, a senior research analyst for the Southern Poverty Law Center’s Intelligence Project. Facebook and Twitter have made efforts to quell anti-Semitism and other hateful language on their platforms, but have done so inconsistently. There’s also a distinction between how anti-Semitism flourishes in places like Facebook and Twitter and on less restricted platforms like 4Chan and Gab, among others, Hankes said. Hate group leaders can use these digital spaces as “megaphones for their poisonous ideologies,” Hankes said, but it’s done differently depending on the platform. On Facebook and Twitter, hate groups can reach an audience that’s not just extremists and may or may not be susceptible to their messages, whereas on Gab or 4Chan, there can be a much more concentrated hub of extremists that’s used to “drive people even further down this radicalization path,” he added. But how could hateful rhetoric then translate into violence like the Tree of Life shooting? “You see people who maybe hold extreme positions or some racist positions spend a long of time steeping and kind of cultivating grievances,” Hankes said, adding there’s a phrase for this: wound collection. “Once they get this idea in their head about this plight they’re suffering from, they start collecting more and more “wounds,” or anger, toward the perceived cause of those problems. And ultimately you see some people go out and act on them,” Hankes said. The Pittsburgh shooting occurred in a week in which two other major crimes captured national attention. Florida resident Cesar Sayoc faces federal charges for mailing 14 suspicious packages to Democratic leaders and critics of President Donald Trump, and a shooting at a Kroger store in Kentucky left two black people dead is being investigated as a hate crime. The Twitter account belonging to the Sayoc was filled with anti-Semitic conspiracy theories, while in the Kentucky case, the suspect, who is white, told a white bystander that, “Whites don’t kill whites,” according to the son of a witness. And in Bowers’ final posting on Gab, he railed against the Hebrew Immigrant Aid Society (HIAS), a Jewish organization that helps the federal government resettle refugees in U.S. homes. 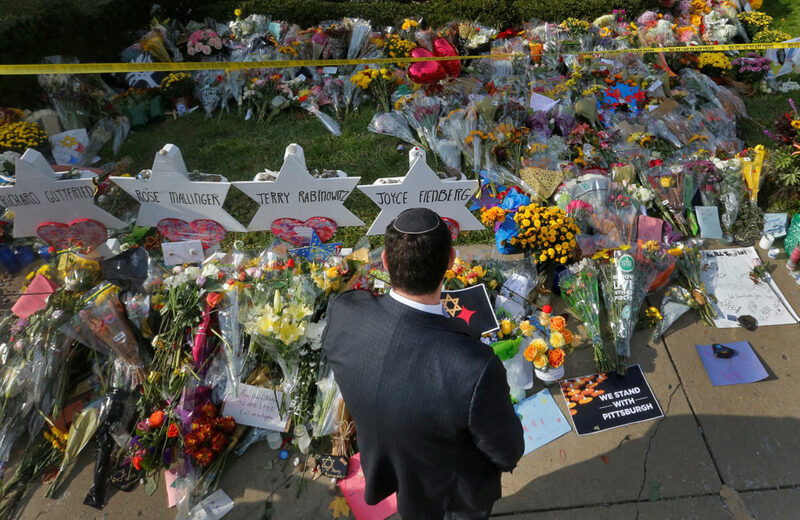 The Pittsburgh shooting is believed to be the deadliest U.S. attack on a Jewish community. Bowers also reportedly made several posts directed at the Central American caravan on his now-deleted social media account. In racist overtones, he described the thousands of migrants as “invaders.” He also blamed Jews for helping the caravan. One recent conspiracy theory blames liberal philanthropist George Soros, who is also a Holocaust survivor, for funding the caravan. In another recent conspiracy theory, Soros was accused of paying people to protest Brett Kavanaugh’s Supreme Court nomination, something Trump himself advanced on his Twitter account. Conspiracy theories like those around Soros also play a huge role in radicalization, Hankes said. “It’s kind of one of those genres of content that really sows distrust and suspicion and makes people more amenable to these racist positions that we see people in organized hate groups espousing,” he said. These theories play into this victimization culture, Hankes said, and makes it easier for someone to say, “Look, the system is rigged against me. I am the victim here.” This is how “out-there beliefs” can get channeled into someone’s ideology, he said. Chiraag Bains, who served for about seven years in the Justice Department’s Civil Rights Division, told the NewsHour that there are many ways these radical ideologies can be normalized. One of the ways is when violence occurs and the government and high-ranking officials don’t do enough to condemn those acts, said Bains, who served under former President Barack Obama. 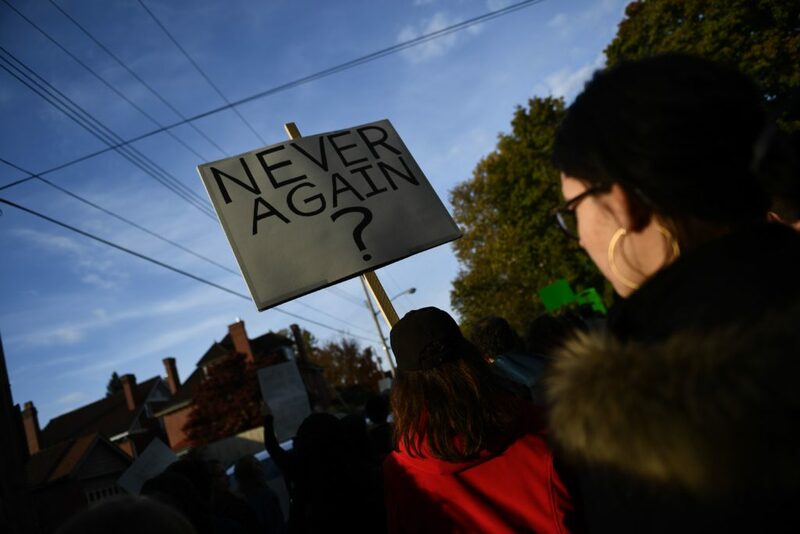 Trump did condemn the Pittsburgh shooting as a “wicked act of mass murder.” Attorney General Jeff Sessions, too, said the killings were “reprehensible and utterly repugnant,” adding that the DOJ intended to file hate crime charges against the suspect. Bains said Trump and his administration has “failed to consistently condemn bigotry.” Hate crimes, he said, are not just attacks on individuals, they’re attacks on communities. That statement, as one critic pointed out, appeared to minimize the anti-Semitic nature of the crime. The president’s comments and policy choices have emboldened people with racist ideas, Bains said. They “may in fact encourage people to hold those views and act on them,” he said. Vanita Gupta, former head of the Civil Rights Division at the Department of Justice, said white nationalists are being emboldened by the country’s highest office. She pointed to Trump calling Mexican immigrants “rapists” and “criminals” at the start of his presidential campaign in 2016, as well as his failure to denounce white supremacists and their violent rally in Charlottesville, Virginia, last year. “Hate has always been a feature of this country’s history,” said Gupta, who’s now the president and CEO of the Leadership Conference on Civil and Human Rights. “It’s just that, for a time, there was a sense that it was in the fringes. But what we’re seeing now is just an emboldening of these forces in communities around the country and in disturbing ways,” she added. White House press secretary Sarah Huckabee Sanders bristled at the notion earlier this week that the president’s words were in any way connected to incidents like the Pittsburgh attack. “You can’t start putting the responsibility of individuals on anybody but the individual who carries out the crime. … The president is not responsible for these acts,” Sanders said in the first White House briefing since the Pittsburgh shooting. Trump, too, has placed the blame over division in the U.S. squarely with the media. On Monday, he tweeted that the “Fake News Media” is “the true Enemy of the People.” It’s a refrain he’s often used against journalists and one that’s been heightened ahead of the Nov. 6 midterm elections. Earlier this week, after the Pittsburgh shooting, Deputy Attorney General Rod Rosenstein said the DOJ was launching a new website that would help consolidate information on reporting hate crimes. “Crimes motivated by racial, ethnic, sexual or religious animus carry a particularly vile moral quality, but because they are defined, recorded and investigated differently across states, we do not fully comprehend their impact on public safety,” U.S. Attorney Matt M. Dummermuth said in a statement. The DOJ also announced a $840,000 grant for the University of New Hampshire to launch a national survey of hate crime incidents, including an analysis on how incidents are reported, investigated and prosecuted locally. The study, expected to run through 2021, will survey 3,000 law enforcement agencies and 250 prosecutors across the country. Overall, hate crime data is underreported. The FBI relies on local law enforcement for that data, but many agencies do not provide reports. ProPublica reported last year that among the thousands of agencies that do, about 88 percent said there were no hate crimes in 2016. “The evidence suggests that many police agencies across the country are not working very hard to count hate crimes,” ProPublica reported. ADL also listed dozens of U.S. cities that reported zero hate crimes or chose not to submit their reports in 2016. More information about hate crimes would allow officials and communities to better counter the problem, multiple experts told the NewsHour. Gupta said there have also been other attempts to get better data on hate crimes. The Communities Against Hate initiative was launched shortly after the 2016 election when civil rights organizations warned of a rise in hate-related incidents. She added that combating this hate is an “all-hands-on-deck” effort that involves local community organizations coming together to promote values of inclusion and diversity, and more collaboration on the law enforcement level to gain the community’s trust when hate crimes occur. When asked about its work on combating hate crimes, a DOJ spokesperson pointed to several of the agency’s prosecutions in recent months, including the man found guilty in July of a hate crime in the 2017 burning of a Texas mosque and the September indictment of a Wisconsin man of a hate crime for mailing threats to Jewish community center. Bains said that hate crime prosecutions have continued under the Trump administration, but it hasn’t had the same level of priority as in the prior administration. Bains pointed to how the DOJ will prosecute the murder of transgender teen yet also try to limit certain civil rights for trans Americans across the country. “The question of civil rights is a lesser priority for this administration,” Bains said.